"I'm not understanding. Do you just attract violent people?" Equal parts 48 Hours, Beverly Hills Cop, and Lethal Weapon along with a heavy helping of Jerry Bruckheimer�s patented slickness, Michael Bay�s Bad Boys is a film that moves quickly and looks terrific. However upon deeper inspection, it becomes clear that there is nothing beneath the surface. Made before many of the principal crew and cast members were as marketable as they are today, Bad Boys's plot is an exercise in futility, yet there is still something in the way in which Bay and his stars effortlessly command the screen. Marcus Burnett (Lawrence) and Mike Lowrey (Smith) are two Miami narcotics cops who have been best friends since childhood, their friendship feels as close as any marriage. Marcus is an untidy family man, while Mike is a ladies' man with a posh high-rise apartment that looks to have been decorated by IKEA. When their largest drug bust ever is stolen from the evidence room at the police station, Burnett and Lowrey go on the hunt for the thieves. Along the way they must protect a witness (Leoni as Julie) to a murder perpetrated by Fouchet (Karyo), the man who masterminded the heist. The plot is very straightforward and the script nails every cliché available in near-perfect order, and yet the picture offers up such energy that it is easy to pass over these problems and go a long for the ride. Bay, moving directly from commercials and music videos to feature films, employs a mood and setting that are now overused in his later films. But at the time of its release, Bad Boys represented a new style of kinetic filmmaking. The climactic shootout is stylish and beautifully shot, proving that Bay was then a filmmaker to keep an eye on. While the stunning visuals offer a feast for the eyes, the script offers agony for the ears. The mistaken identity subplot in which Julie thinks Marcus is Mike and vice versa, is so unnecessary that I half expected Mr. Roper to come barging in. Another fault of the script is that too often characters spend extended amounts of time talking and firing one-liners that it becomes improbable they would still be alive while doing so. For example, a moment in the climactic shootout when Marcus is standing in the crosshairs of a bad guy, he spouts a catchy phrase before firing and kills the guy instead. It is in these dumbed down moments that Bad Boys is truly groan inducing. 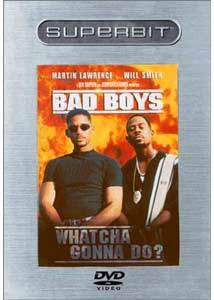 Originally intended as a starring vehicle for Jon Lovitz and Dana Carvey (you are no doubt shaking your head at the moment and well you should be), Bad Boys receives a needed boost from stars Will Smith and Martin Lawrence, who have an intense chemistry that is evident in nearly every scene, including those that are improvised bits of bickering. It is reported that Bay did not like the script and allowed his stars to converse freely while the cameras rolled. It is likely that in doing this, the director saved what could have been a disastrous script from consuming the film. Image Transfer Review: For this Superbit release, Bad Boys receives a pristine 1.85:1 anamorphic transfer that ranks as reference quality throughout. The vibrant colors of the Miami skyline as well as the soft orange glow of the sunsets shine on this transfer, offering eye-popping detail and vibrancy. The print used is free from flaws after the credits sequences. Edge enhancement is never an issue and I noticed no pixelation or artifacting. Audio Transfer Review: The Dolby Digital 5.1 mix on the previous release was already terrific but I am wholly amazed at the DTS mix available for the Superbit release. The DTS offers improved clarity and direction over the previous release which is evident in the numerous action sequences. Bullets land with precision in the surround speakers while the .1 LFE track shakes the room. Extras Review: As with all Superbit releases there are no added features. I have owned Bad Boys in nearly every format in which it has been available on home video. The new Superbit release runs circles around all of them including both the previous DVD as well as the stunning laserdisc release. Highly recommended.